I'm planning on ordering thLucky Red Clover Bag Triple Strength Mojo Hand but I was curious if it arrived with the bag clear of it's contents and I put them in myself? I was hoping that when I got the mojo that with the herbs already included and the herbs I intend to purchase would result in an odd number. I also plan on purchasing Van Van Oil to dress my bag in addition with the oil that comes with it. However, if the bag is already filled when it arrives, before doing any of the instructions (that come with the bag right?) can I open it and add the rest of the herbs that I bought not coming with it, then begin to follow the instructions by breathing on it, dressing it, smoke it..etc..
All LuckyMojo mojos come with the versus herbs and curios in them. You can certainly add additional herbs when you get your bag, but keep in mind that mojos are small bags so room may become an issue. They are about 3 inch's from the bottom seam to the top and almost the same from bottom corner to corner. Just something to keep in mind. Also a triple strength mojo is quite strong and additional herbs may not be necessary but if you feel that you should add some then by all means do so. would I "break the mojo" by opening the bag RIGHT when the kit arrives to add the other herbs I ordered on the side or will it still be okay? would it be okay if my boyfriend knew that I was doing the work and ONLY he and I? Or would that break the mojo? I'm 100% sure he would be totally fine with it and keep it secret and also wouldnt touch the bag or look for it once I 'set it in action' and stress that he couldnt or it would break the mojo. Plus I should mention that we live together in a very small apartment so it would be hard to keep it secret.. Anyway, would my bag still work even if he and I knew about it..but didnt tell anyone else and he didnt touch it..
Also I forgot to mention, would it be okay if my boyfriend knew that I was doing the work and ONLY he and I? Or would that break the mojo? I'm 100% sure he would be totally fine with it and keep it secret and also wouldnt touch the bag or look for it once I 'set it in action' and stress that he couldnt or it would break the mojo.. Plus I should mention that we live together in a very small apartment so it would be hard to keep it secret.. It is a triple strength bag, so you should leave it alone. A lot of the herbs you list are redundant herbs, such as allspice and nutmeg. Those are money herbs and star anise is for psychic vision. Your bag will not be complete when you get it. You need to blow into it and put a personal concern into it and seal it. This will make the mojo bag yours. Others can know about your mojo bag, but do not let anyone touch it. Instructions do come with the bag right? Just so I can avoid goofing..
jadejenova wrote: Instructions do come with the bag right? Just so I can avoid goofing.. Yes, written instructions come with every Lucky Mojo hand. I ordered a Lucky Red Clover Triple Strength mojo, and although I've read they are quite strong, I'm wondering if after an extended time period I should re-add the roots and herbs? I did expect the quantity of herbs to be more, as the herb ingredients only take up about 1/4 of the bag. Do similar proportions of every herb need to be re-added, or is it okay to add a little more of one herb verses another. You really have no need to add more herbs to a professionally made triple strength mojo bag, epically one from LuckyMojo, their just made so well . Bags aren't usually stuffed to bursting with herbs and things, it wouldn't be very easy to carry around now would it lol. Once a year you might remake it by washing off the hard bits and replacing the crumbly ones but you basically remake the whole bag then and if your not skilled you might want to simply buy a new one, but then not everyone believes that such things need to be done. But yeah you really don't need to add anything to a bag other then the personal concerns and a petition/name paper. I second the idea that the bags aren't usually stuffed full. I've had a variety of mojo bags from LM over the years, more than a few of which were obtained just to see how they were put together/what was in them - and out of all of those, only one has been stuffed really truly FULL. The ones that I bought for my own personal use were just as efficacious filled just the way they were. I want to buy a mojo bag I need one for protection, one for peace, one for sucess and one for lucky. I am wondering can I have one for all three or I have to have three different one's, with that said if I have to have three different ones I was thinking about fast luck, lucky hand, or money stay with me for luck (for luck). Fear not, fiery wall, stop gossip(for protection). tranquilty, clarity and healing (for a clam and cool state of mind). Crucible of couage, crown of succes, road opener, king solomon and five fingers (for sucess) Is it possible to get all of those in one? or is there one that is better then the others in there group? Wanttounderstand wrote: or is there one that is better then the others in there group? No not really. Triple strength hands are more powerful, but each hand you listed has a different focus. 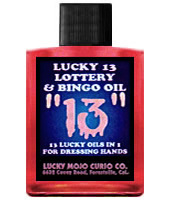 LuckyMojo wrote: Our most popular mojo is a general all-around good luck, money-drawing, love-drawing, and health-protection conjure hand made with John the Conqueror root, Dragon's Blood, Devil's Shoestrings, Mojo Beans, and much more, dressed with Lucky 13 Oil. Ask for The Triple Strength Lucky Red Clover Bag. I would suggest the triple strength edition. You could pick your most pressing issue and get a mojo bag for that, then burn candles for the rest. As some of you might know, I only joined this forum a few days ago, and I am totally new to the world of Hoodoo, so please forgive me if my question seems silly or ignorant. I am still trying to learn. I would like to create my first Mojo bag. Now, I do know that there are many types of Mojo bags and that they can be created for different purposes, such as for attracting luck or money. What I really would like to know is, is there a Mojo bag that is a more "general" one, that can be made and kept for general purpose, as an every day Mojo, or are they really each specific to different things? I really would like to create a personal Mojo for myself that is for general daily happiness, protection and well-being, that I could carry with me each day.... something that applies to every-day life....Is there such a thing? And if so, what is included? What materials would I need? Roses are blue...do you get this reference? You may be interested in the Lucky Red Clover mojo; it's an all-purpose bag for general good luck. Thanks very much, I'll take a look. It sounds as if the Luck Red Clover Mojo is just what I have in mind. Hi all, just wanted to know what the Southern Style Herb Mojo Hand is for that is different from the Lucky Red Clover Mojo Hand. If you have an objection to animal curios, the Southern Style has none. I'm looking to purchase my first mojo, the only problem I don't know which mojo to choose. I know it can do both, just not sure if its an at the same time. I was also looking at a "blues man hand" since I'm a writer and slam poet who's looking to do a cd of my work and -maybe- start a musical project. I'm not a man however, is that okay? Also, I've been meaning to ask this question for awhile. I'm disabled so my roommate helps me do things does that make my hoodoo less effective or is the same since they just act as my "hands"? we're trying to figure out the mojo hand...cause she'd see it to help me pin it on. If you want to attract pretty much all things good, get the Lucky Red Clover bag. Interesting question on the having a helper - I'll be interested in hearing the answers. Thanks! I wasn't sure since I don't want a too specific mojo. I would think intention counts and since she's just like...lighting candles...stuff that i'm unable to do...she's acting like an extension of me. Im not sure if this question has been asked in a previous thread or not however, I was wondering if LM can personalize your mojo hand with more then 3 desires. If so, how many desires can be in one hand? http://www.luckymojo.com/mojocatmojo.html#custom ...call the shop with specifics. Good Luck! That way you'll bring in good spiritual energy to all your projects and aspirations. I ordered my first hand! Lucky Red Clover. Got the triple strength version of the Lucky Red Clover. Also ordered Attraction oil and incense and Fiery Wall of Protection oil. The FWoP oil is mostly to anoint myself. As you know Lucky Red Clover Mojo bag is a general good luck, love drawing, money drawing and health protection mojo. It includes powerful roots, minerals, and herbs such as John the Conqueror (a strong luck drawing in love, money, etc..etc...), Dragon's Blood (draws good luck in money and love and wards off evil), Devil's Shoestrings (protection from crossing) and Mojo Beans (make wishes come true)...so you see it works! Keep your mojo fed and talk to it, tell it what you want it to do. Good Luck in your work. This is my second time working with LM products! I figured this would be a good "Starter" mojo bad for me. The attraction oil and incense is to give it a bit of extra UMPH in the drawing area. Well the package arrived. I prepared it stuttered a bit during the little preparation work but I think I got it going. You will love your Mojo and it sounds like you have ordered some wonderful other products as well! Stay posted and good luck in your work! Besides that, the man that I have a huge crush on at work has been going to extremes to get my attention. I honestly don't know if it's the attraction oil or the mojo bag but damn they're working lol. It's so freaking cute. Everytime I glance over his way he's Always staring at me. Yesterday he poked me near my side and said hey I'm more than happy with my mojo bag. By the way, I found out how to find out exactly what my mb likes and doesn't like. I tie a string around the top and use the bag itself as a pendulum. Works wonders!! I found out that mine doesn't like whiskey and prefers oils. I even askedif it if it would like to be named and it was a huge yes so I named it Lovely. Try it sometime. It really works! Thanks for posting -- i would call that a definite success! Just wanted to share that I got my first mojo hand today -- triple strength Lucky Red Clover. I goofed a little during the prep, spilling some Lucky 13 Oil and then sopping it up with the bag. Followed the instructions otherwise to the 't', although I had trouble identifying the angelica root at first and probably also anointed the Irish moss. Anyway, I personalized the prayers a little after reciting the 23rd psalm and also anointed the bag with holy water I got from the Church. That's ok, I assume? I received a new triple strengh mojo back about 2 weeks ago and yesterday I started to win a lot of different contest in one day. I noticed the day after these amazing wins, strange things started to happen like; a mentally deranged man was knocking on my mothers door, then my mothers car was having all sorts of problems; then we almost got in a very bad accident where we could have died. My daughters door was kicked in by her ex-boyfriend. It seems like things were working just like when I had that extreme good luck, then it turned to a lot of bad occurences. Can you please tell me what's going on? You will need to say what kind of triple strength bag it is. We make triple strength bags for gambling, for health, for job-setting, and for love. It is a triple strength good luck mojo bag. Its your mojo hand, not your daughter's or your mother's. Their situation is not related to you as the mojo hand is fixed for you and working on your behalf. Also I wouldn't say that avoiding a bad accident is a bad occurance. It sounds like you were quite fortunate. Your mojo seems to be working. Ali is right; what happeed to other people was not your business -- and you were saved from a bad accident. It sounds like your family could use some cleansing and protection work, and perhaps a triple strength good luck bag for each of them. I appreciate all the replies because I didn't look at the fact that I was saved from the accident that almost happened. I am truly blessed. My family would not use any of the cleansing products because they are devout christians, but I now know that I can still help to protect them myself. I want to thank you all so much. This was really helpful. I agree with all of the above. You are misattributing things that have nothing to do with you. Okay, I'll ask this here as I am not sure if this has been asked or answered - or if it is worth starting another thread. This will also be my final question before I place my latest order (this time direct rather than reseller! Yey!) So I want to thank the forum for working so hard to answer all the questions you get asked, it really does help people when selecting products. Your all a blessing! So, now for my question, I wish to order my first mojo bag & I wanted to know if I should include comments for what I will be using the mojo for when ordering or if that is my job when it arrives? Or does LM pray over it in a general manner? Basically, do you write your request similar to when MISC set candles for you? Lucky Mojo prays over all their products in a general manner. You can add a comment, but it is not necessary Choose the mojo hand that is appropriate for your situation, for example, love, money, a job, protection, etc. When you get it add a personal concern and a petition, if you want. Tie it and it's yours. Wear it next to your skin as much as possible. I'm unclear about the difference between the lucky red clover and the attraction mojo bags. Can somebody tell me? Our most popular mojo is a general all-around good luck, money-drawing, love-drawing, and health-protection conjure hand made with John the Conqueror root, Dragon's Blood, Devil's Shoestrings, Mojo Beans, and much more, dressed with Lucky 13 Oil. Attract both love and money (Attraction Mojo Hand). Each Lucky Mojo Bag comes complete with a vial of Attraction dressing oil. The difference is that the Lucky Red Clover Mojo bag has the added bit of luck in it for Good Luck and Health-Protection, as well as for love drawing and money drawing, The Attraction One will help you attract, specifically, Love and Money, but not the Luck or Health Protection. It is all in the ingredients used for each bag, as well as the specific condition(s) it is made for. Thay're just different -- like, you know, what's the difference between rhubarb pie and strawberry rhubarb pie? Well, one has strawberries in with the rhubarb! Its according to what your intentions are for the bag. cat made the Lucky 13 bag for customers who wanted an all purpose mojo. I don't see the Lucky Red Clover Mojo Bag. Is the Lucky 13 is the same? Also wanted to know of Master Hand Mojo Bag is that much better than the others? Can I add something extra in either bag to help improve more my luck? Are you talking about Master Root? This thread is about Lucky Red Clover. The Master Hand is a Jack Ball, not a mojo bag. They can be used for similar situations and have been called "all-purpose" by some. They are made differently, use different ingredients, and some people just prefer one over the other. Was there a specific aspect of the Lucky Red Clover Mojo Bag compared to the Master Hand Jack Ball that you would like us to address? jimenec1, here is the Lucky Red Clover Mojo Hand, and you can order right in the forum by clicking on the blue Add To Cart button. We do not make a Lucky 13 bag; that is the oil that comes with some bags. You cannot add any roots to the Jack Ball as the roots are already wound up inside it. It is NOT a mojo bag. I would like to get help in getting a mojo that increases and opens roads in my life, in all areas, love, money, career, psychic, etc. I have had a rough life up and am doing everything possible to make things as great as I'd like them to be, now I'd like some help. That's a tall order for a single mojo hand. To open your roads and get rid of what's been in your way, consider doing the Uncrossing Spell Kit and then following it up with the Van Van Spell Kit. Both those kits come with mojo bags in addition to the other work you'll do. Here are the links to those: http://www.luckymojo.com/spell-uncrossing.html & http://www.luckymojo.com/spell-van-van.html. The Van Van kit's mojo bag is a Southern Style hand which is an all round Lucky hand that covers many aspects of life. If you want simply the mojo, then consider the Lucky Red Clover bag which is a very popular and effective multi-purpose hand.